I was recently sent some Ambrosial Granola which is an award winning cereal. They make three flavors including Grecian Grove Granola, Athenian Harvest Muesli and Venetian Vineyard Granola. 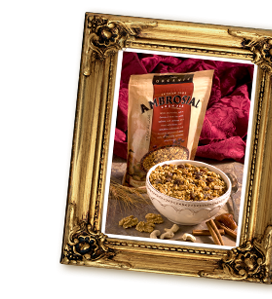 Here is some information about the company: Ambrosial Granola is all about wholesome and clean nutrition. We are a Brooklyn company crafting award winning, nutrient-dense, certified organic granola and muesli of the highest quality. We are dedicated to organic manufacturing and passionate about contributing to improving health by offering life-sustaining foods. My favorite of the products that I was sent is the Venetian Vineyard Granola which contains walnuts, dates and cashews. It is a good source of omega-3 fatty acids. This granola was tasty on top of yogurt for breakfast. It kept me full until my 10 AM snack that I have each day. The granola is not highly flavored so I did prefer it over a flavored yogurt such as vanilla instead of plain. These granolas are 100 percent organic and use wholesome, quality ingredients. The giveaway will be for a bag of each of the Ambrosial Granola flavors. Grecian Grove Granola sounds good!!! Grecian Grove Granola sounds yummy. Athenian Harvest Muesli sounds exotic, Goji berry (never tried that before) with hazelnut and apricot. That would be my pick. I like the Grecian Grove granola. Thanks! The Athenian Harvest Muesli is intriguing!! and they all sound scrumptious!